The MatlabKK-Robotic-Visualization Tbx has been developed by the research group Computational Engineering and Automation at Hochschule Wismar, University of Applied Sciences. It offers a 3D-visualization of several industrial robots in Matlab controlled by the MatlabKK-Robotic Tbx. The development of robot application can be realized within Matlab by using the MatlabKK-Robotic Tbx, which offers an easy to use, homogeneous software environment for different robot types using a uniform instruction set. 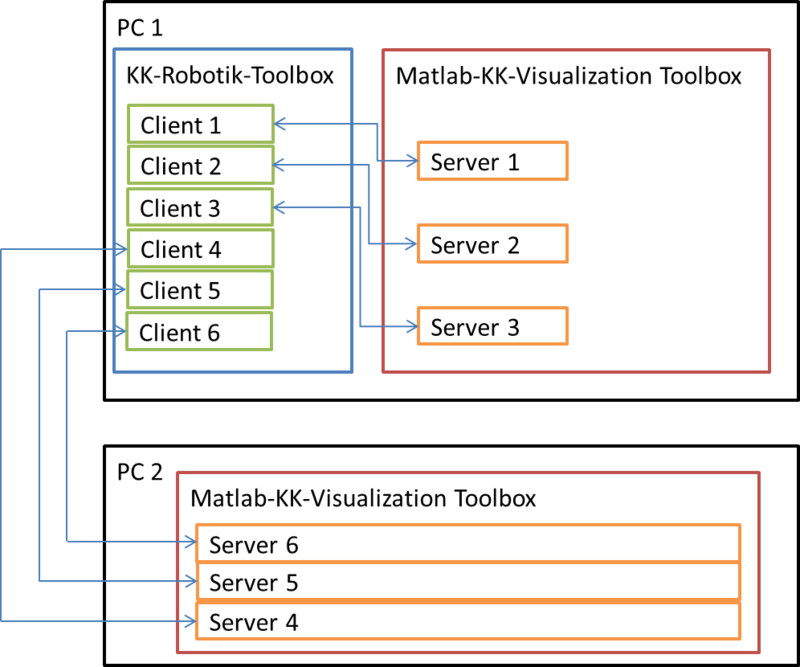 The MatlabKK-Robotic-Visualization Tbx is an extension of the MatlabKK-Robotic Tbx and it supports the throughout development of robot application on common PCs using only Matlab. In detail the Visualization Tbx interprets control commands generated by the MatlabKK-Robotic Tbx and performs all associated movements and reaction within a 3D-visualization. Common PCs can visualize up to 5 robots with adequate performance. Currently the robot types KUKA-KR3 and Kawasaki-FS003N are supported by both toolboxes. Please have a look on our three demo-videos: video1, video2, video3. The MatlabKK-Robotic Tbx uses TCP/IP for the communication between the MATLAB-based control application on the PC (control-PC) and real robot controllers and visualized (virtual) robots. Visualized robots can either be located and executed at the control-PC or be distributed over different PCs in a local network. Figure 1 shows the control of six robots (Server 1-6) distributed over two PCs. PC 1 executes the MATLAB-based control application using the MatlabKK-Robotic Tbx. and it visualizes the behaviour of three virtual robots using the MatlabKK-Robotic-Visualization Tbx. 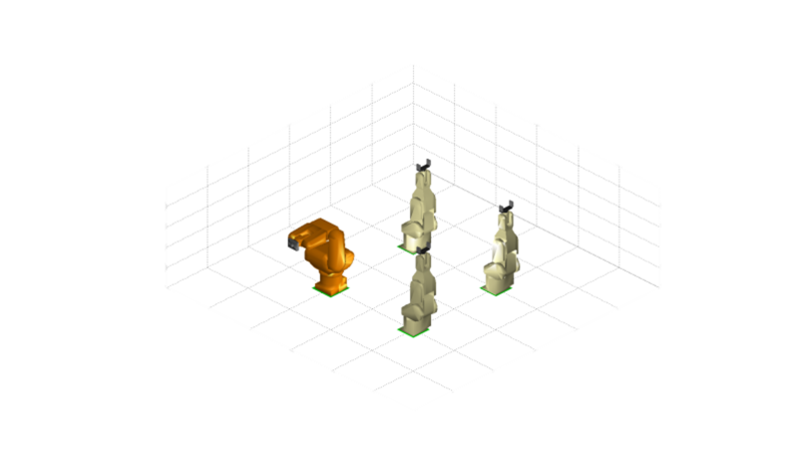 Moreover, three additional virtual robots are visualized on PC 2.